I dreamed this recipe up a few years ago and it is one of Brent’s favorites. Anytime I take it to a party it always goes over really well and I get asked for the recipe. Once there was someone was telling people that they weren’t any good. I overheard this and didn’t think much of it until Brent told me later that the guy asked for the recipe. Odd, right? He admitted to Brent that he was telling people they weren’t yummy because he didn’t want every one else to eat them. It was kinda genius if you ask me. 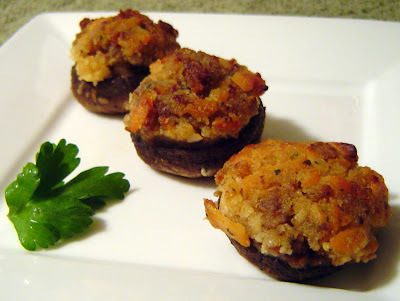 Anyway, stuffed mushrooms do take a little bit of prep work, but they are worth it in the end. You can prep them up to a day in advance; just make sure you cover them before putting them in the fridge. 1. Break up and brown sausage in a large skillet over medium high heat. 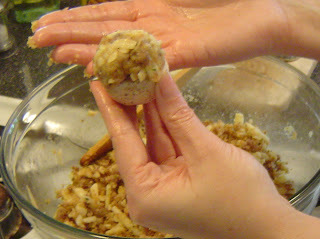 Once done, drain well and place on a paper lined plate to cool. 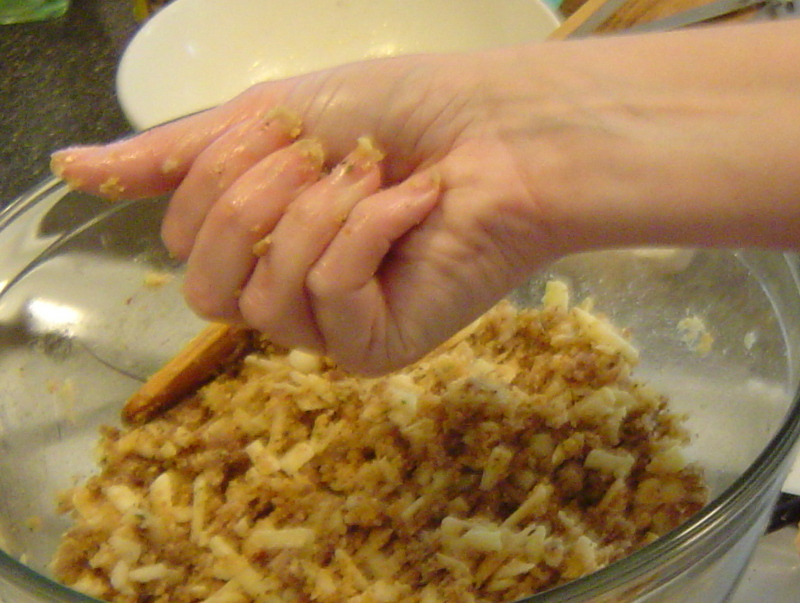 You want to omit as much grease as possible. 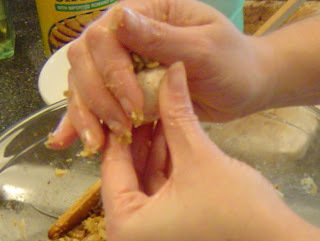 Once cooled, give a rough chop to eliminate any huge pieces. 2. While sausage is cooking/cooling, de-stem mushrooms and wipe off excess dirt with a damp paper towel. Season with salt and pepper. 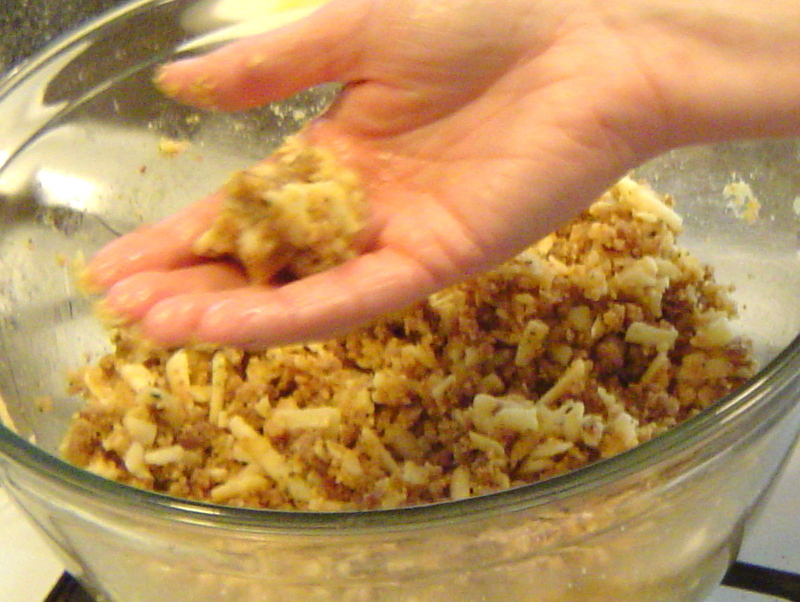 Also take this time to shred the gouda with a cheese grater. 3. 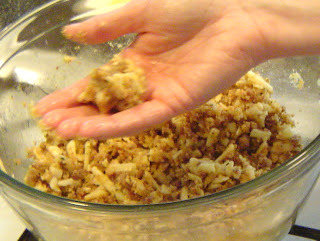 When ready, combine sausage, cheese, butter, bread crumbs, and spices in a large bowl. Stir to incorporate. 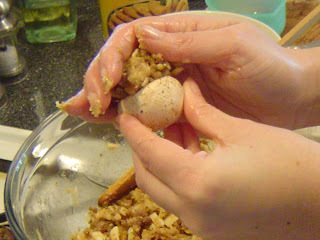 Next stuff each mushroom with a teaspoon to tablespoon amount of stuffing depending on size. It’s best to form a rough ball first and then form to make a dome on top of the mushroom. See the pictures below. Place on a baking sheet that has been lightly sprayed with cooking spray. 4. Bake in a 350 degree oven for approx 20 minutes or until tops are lightly browned. Thoughts: The sausage and smoked gouda work in perfect harmony here. 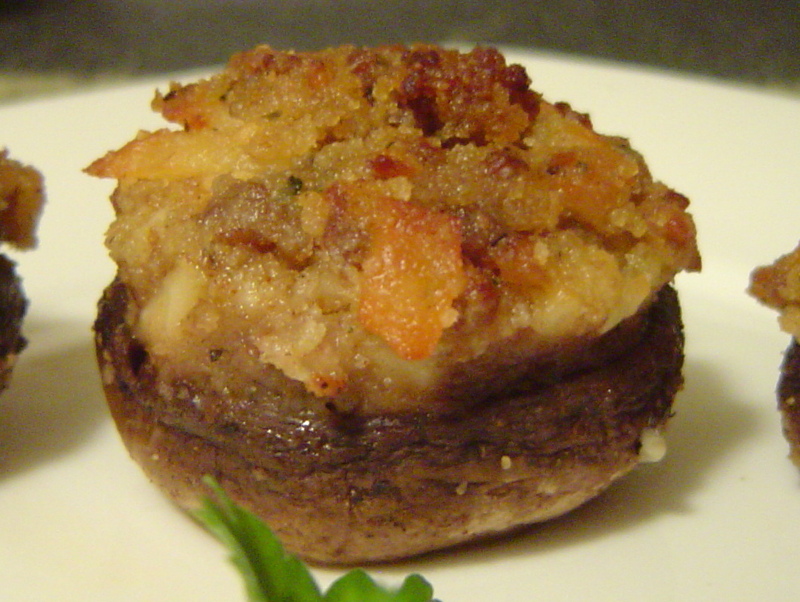 The smokiness of the gouda shines through and sausage gives a lovely savory flavor. I know the recipe calls for a good amount of butter, but don’t worry it’s just enough to keep the mixture together and add the exact amount of richness you want. The mushrooms are cooked through but still retain their shape and by baking them it gives them a more robust flavor. Just beware that these guys can be addicting and you may have a hard time resisting reaching for just one more.